Tell Virginia Regulators: No New Coal! By now you've heard that Dominion Virginia Power is planning to build a new coal-fired power plant in Wise County, Va. The Richmond Times Dispatch projects that this plant will be "one of the biggest air polluters in Virginia." It will cost $1.6 billion, and will emit more than 5 million tons of carbon dioxide annually (the equivalent of adding 200 million cars to the road!). And best of all, Virginia ratepayers will foot the entire bill. It is absolutely critical that the State Corporation Committee (SCC) hears from you. Let them know that Virginians DO NOT WANT NEW COAL PLANTS! Click here to submit written comments to the SCC! There are plenty of reasons to dislike this power plant plan even if you're not an environmentalist. Virginia is last in the nation in spending on energy efficiency and conservation, so even minimal efforts to save energy will result in big savings. Why wouldn't we invest in conservation before blowing $1.6 billion on a new plant? There's also the question of the future price of coal power. With legislation increasing the price of carbon emissions coming down the pike, other states are trying to reduce their reliance on coal now to avoid feeling the pinch from high coal power prices down the road. Virginia, on the other hand, is moving us towards more reliance on coal. In fact, Google is gambling that it can make renewables cheaper than coal even without carbon pricing. So to recap, building a new coal-fired power plant will cost us a lot now, cost us a lot later, and hurt our environment. Why is this even a close call? Please take a few minutes to contact the SCC right now! Can a Steakhouse be Green? Can you be an environmentalist and have a cheeseburger every now and then? It's a debate that recently caught fire over at Gristmill, as well as on AOL Instant Messenger between myself and a friend after I told him about Ted's Montana Grill, a steakhouse with some eco-friendly practices. I won't get into the Gristmill debate because I think it was yet another example of PETA doing whatever it takes to get publicity. But I have a lot of respect for this friend, so when he said a steakhouse can never be "green" because it serves so much meat, it got me to doing some thinking (and fortunately for you, blogging). My friend is an environmental vegetarian, choosing not to eat meat because of its production's detrimental effects on the planet. Because of the intensive amounts of energy it takes to raise cattle, and to a lesser extent pigs and poultry, some environmental vegetarians will make the case that you can do more to lower your carbon footprint by not eating meat than you could by switching your car to a Prius. Fish isn't necessarily much better unless you're eating sustainable seafood. The Green Miles, on the other hand, is an omnivore. We don't ask people to stop driving altogether. Why should we ask them to stop eating meat? I recognize the detrimental effects of beef production, and just like I try to avoid driving when I can, I avoid red meat when I can, recently switching to vegetarian lunches. Bison are leaner than cattle because they are still wild animals who range and eat grass; they do not tolerate confinement well, and so they cannot be fattened the way we do cattle, which we have bred to eat rich corn mixtures their entire adult lives. Growing corn to feed cattle costs the nation dearly in terms of pesticide and fertilizer runoff. The pollution and inhumanity of the confinement-feedlot beef system make it one of postwar America's biggest ecological blunders. Bison, on the other hand, eat grass that grows freely, and the manure they produce is a natural fertilizer. True, some bison ranchers are irresponsibly corralling and then "finishing" their animals with a fattier diet of grain just before slaughter. This makes the meat richer, more like beef. Ted's Montana Grill serves grain-finished bison, for instance, although CEO George McKerrow Jr. says the chain is testing grass-finished meat for consistency and quality. Will Ted's save the planet? No. But they don't claim they will. I didn't even know about their eco-friendly features until I went in search of a tasty low-fat burger. And considering how few Arlington bars and restaurants have any green features at all, it's nice to see an establishment going after some of the low-hanging fruit on sustainability. Why don't other places do more? It's a good question for the Arlington Chamber of Commerce. Ask The Green Miles: Most Vulnerable to Sea Level Rise? Is there a place that would show a rising ocean first and most dramatically? Would it be Florida, Holland, Venice, Bangladesh, some Pacific Island group, or where? Or is it too soon for that kind of extrapolation? Too soon? The impacts are already right here in my backyard. No fewer than 13 islands in the Chesapeake Bay have already been swallowed up by rising sea level. According to a recent National Wildlife Federation report, over the last century air temperatures in the Bay region have risen 1.4 degrees, water temperatures are up two degrees, and sea levels have risen two feet. That's due mostly to thermal expansion (warmer water takes up more space than cooler water), not melting glaciers or ice caps as commonly though. - New Orleans (I know, you're shocked). It's below sea level already and still sinking due to subsidence, the natural compression of land composed of flood deposits. Why hasn't this been a problem until now? Because before people came along, the land would sink, then Mississippi would flood and retreat, leaving a layer of sand and silt to build it back up. Then we decided to put levees up and build on the floodplain. Now there's just sinking, no silting. - Hampton Roads, VA (Hampton/Norfolk/Newport News/Virginia Beach), just a few feet above sea level and home to major naval installations. - Miami, three feet above sea level. - Lower Manhattan and its hundreds of miles of subway tunnels. All of the above are not only below or right at sea level but are in prime hurricane landfall zones. But let's be honest - as the richest country in the world, America can afford to build flood barriers or even relocate key populations without a devastating economic impact. Globally, it's the poor nations that can't afford to adapt that will be hit the hardest. Island nations just a few meters above sea level like The Maldives face grave threats, but for total number of people threatened, I'd have to go with Bangladesh. Not like they're so safe and sound to begin with - a recent cyclone killed 3,400 people, about twice as many people as killed by Hurricane Katrina. One estimate says just a 1.5 meter rise in sea level could affect 17 million people in Bangladesh. The most frightening part about sea level rise is that no one can truly say how fast it will occur. The human brain tends to think of everything as rational and directly related - a 1% rise in temperature will result in a 1% rise in sea level. But as anyone who has ever, say, made ice knows, at the margin a one degree difference is all it takes to go from solid ice to water. How will we know if and when we're approaching a similar tipping point? The United Nations International Panel on Climate Change has more or less punted on the issue, focusing on sea level rise probability due to known factors like thermal expansion. Now Arctic Sea ice is retreating faster than even the most pessimistic projections. Can anyone say definitively that Greenland's ice sheet, with its potential to raise sea levels 20 feet, won't beat expectations as well? Wikipedia can tell you much more about sea level rise. And if you have a question about the environment, ask The Green Miles! Vote for NWF for Nonprofit of the Year! Please vote for the National Wildlife Federation for MySpace Nonprofit of the Year! You'll make Ranger Rick very happy. Global warming is destroying species, raising sea levels and threatening millions of poor people, the United Nations' top scientific panel will say today in a report that U.N. officials hope will help mobilize the world into taking tougher actions on climate change. The report argues that only firm action, including putting a price on carbon dioxide emissions, will avoid more catastrophic events. Those actions will take a small part of the world's economic growth but will be substantially less than the costs of doing nothing, the report will say. Your humble blogger was asked to open the event. I detailed both the threats to the very waterfront we were standing on and the vast, so far untapped possibilities that could slash our carbon emissions. Relative sea levels have risen a foot in the Chesapeake Bay over the last century, a combination of higher water and subsidence, the same phenomenon that left Lousiana so vulnerable to Katrina. Already, the Bay has lost 13 islands to the rising tide, and according to the National Wildlife Federation, relative sea levels are expected to rise another 22 inches over the next 93 years, as I'm demonstrating here. Oh, this would also be a good time to mention the NET had us wear life preservers to emphasize the threat of rising water. "We are now more dependent on foreign oil than we were on 9/11," Clinton said. "We are basically at the mercy of all these oil-producing regimes ... that all too often use that money against us. "We have all this empty federal land in Nevada. It should be packed with wind turbines and solar panels," she said. There's no silver bullet to solve the climate change problem, but there is, as we say in the NWF's hunter and angler outreach, silver buckshot - a series of solutions that can add up to get us to cutting carbon emissions 80% by 2050, the minimum scientists say is needed to curb the worst effects of global warming. It was fantastic to see the Democratic Party's presidential frontrunner recognize that we've left such obvious low-hanging fruit unpicked. 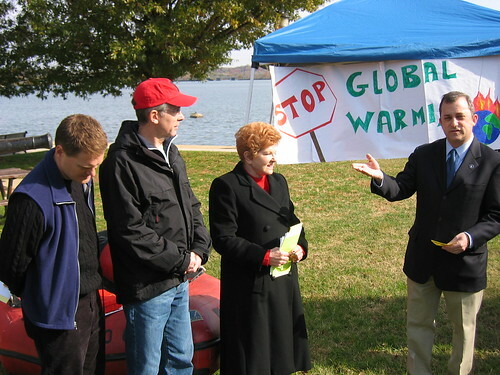 The Chesapeake Climate Action Network's Paul Burman (seen at right in the orange vest) closed the event detailing CCAN's efforts to block Dominion Virginia Power's planned coal-fired power plant in Wise County. If you believe some sort of levy on carbon emissions is coming, as virtually everyone does, then why would you invest $1.6 billion ratepayer dollars in a form of energy that's currently low-cost but is certain to get much more expensive in the future? Regardless of your feelings about the environment, it makes no economic sense. You can check out a clip of my talk on YouTube and a full photo gallery of the event over on Flickr! The Arlington Green Living Gala! Join Arlington County leaders for an environmentally friendly celebration to premier the documentary Upclose: FreshAIRE and present the Green Living Challenge Awards to Arlington’s greenest residents and neighborhoods. The festivities will celebrate Arlington’s efforts to reduce emissions and honor Arlingtonians committed to protecting our environment. Meet and learn from your neighbors who are leading the way in greening their homes and lifestyles. 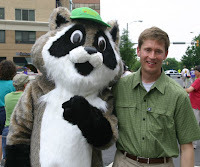 Special guests will include Paul Ferguson, Arlington County Board Chairman, the Green Living Challenge winners and Professor Rob Farr, the rakish and affable star of the Fresh AIRE Tips Free. Refreshments will be served. Pain at the Pump: A Thanksgiving Tall Tale? Gas prices are nearing record highs. So people are driving less, right? Of those who said they had changed their behavior, 90 percent said they were driving less, and 75 percent said they were better maintaining their vehicles. "This is the first time that we have seen gas prices tipping over $3.00 a gallon in November," said AAA's Darbelnet. "A year ago, prices were in the range of $2.20 a gallon, so this year travelers are really feeling the pinch." Ah, there's another hiccup. Are drivers really "feeling the pinch"? Obviously drivers are allocating more of their budget to paying for gas. And the media certainly loves to play to populist themes to convince their audience they're clearly not highly-educated McMansion-dwelling SUV-driving elitists but rather Average Joes like them. But if high gas prices were causing a such a painful "pinch," wouldn't people, like, y'know, drive less? Nope. Gas consumption hasn't posted year-to-year decline in more than 15 years. Well then Americans must be demanding more fuel-efficient vehicles, right? Nope. Fuel economy hasn't increased significantly in 25 years. In fact, it's not a whole lot different than it was 57 years ago. OK, OK, so aren't Americans demanding changes from their elected officials? Eh. The energy bill is stuck in Congress and tighter fuel economy standards face an uncertain future. In Iowa and New Hampshire, there's not much reason for presidential candidates to talk about any of this: In those relatively thinly populated states, people think a 20-minute back-up on the Interstate is bad traffic. There are plenty of ways we could reduce our national gas bill -- more carpooling and public transportation, higher fuel economy standards, plug-in hybrids, biofuels -- but it seems like both the majority of Americans and the majority of elected officials would rather rail against those dastardly oil barons than embrace real solutions. And as Stuart Smalley once said ... every time you point a finger at someone, there are three fingers pointing back at you. I was tossing some old bread out into my backyard in Ballston today (my first-floor apartment has a back door) to my usual customers of sparrows, starlings, and squirrels. As soon as the weather turns colder business picks up considerably, so this afternoon dozens of them had gathered. All of the sudden every single one of them scattered. Not just their usual, "A person's coming, let's hang back for a minute, but I still got dibs on that piece of crust." They took off like their lives depended on it. Then I saw why. 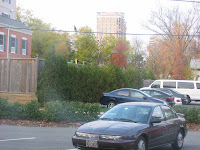 The tall bushes across the parking lot shook and out flew a hawk. We'll call him Mordecai. He landed on a utility line above the parking lot. 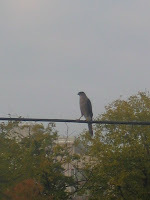 Not particularly large for a hawk, but he still had a wingspan of close to four feet. If Mordecai had been in a better and less noisy position, I'm sure any of the birds or squirrels that had been in my backyard would've made a tasty dinner. I've spotted several hawks in Arlington, usually in Rosslyn where the local parks make a good habitat, the tall buildings provide places to perch, and the urban setting serves up plenty of prey. 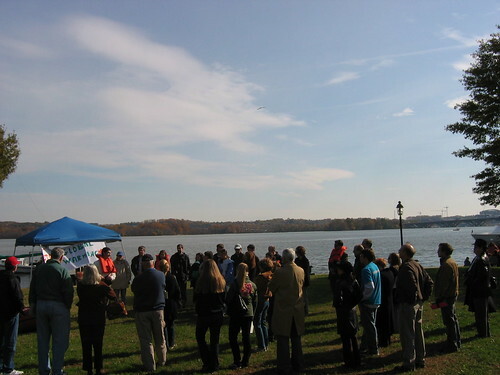 My closest encounter came on Roosevelt Island during the 2006 ACE Hike & Happy Hour, though it wasn't as close as the meetup vividly described by Herb of DC. I'd like to think the sighting isn't completely unrelated to Arlington's ongoing environmental efforts and its certification as a Community Wildlife Habitat, wouldn't you? Some government scientists have complained that officials at the Smithsonian's National Museum of Natural History took steps to downplay global warming in a 2006 exhibit on the Arctic to avoid a political backlash, according to documents obtained by The Washington Post. In the interview, Samper said "one of his main concerns" was that the exhibit was indicating a level of certainty that he thought went beyond the contemporary science. "I think as scientists we present the information, but we let the people draw their own conclusions," said Samper, who was promoted earlier this year to serve as acting secretary of the Smithsonian. I wonder what Mr. Samper thinks of Newton's Laws? Should we stick with "what goes up must come down" or should we just present the information and let people draw their own conclusions? It's phony uncertainties like this that have given the public a skewed perception of the science of global warming. It's not just Bush and his cronies - the media is also to blame. If you want the straight, unadulterated science on global warming, go to RealClimate.org. What's Your Connection to Mountaintop Removal? Mountaintop removal is a radical form of coal mining where entire mountains are literally blown up -- devastating communities throughout Appalachia, polluting drinking water and destroying rivers. And the worst part is, you're paying for it. 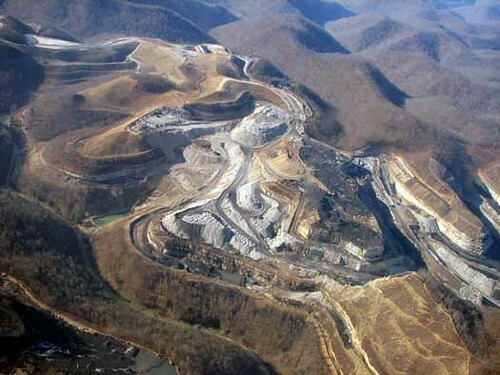 If your home or business is on the electric grid, chances are you are connected to mountaintop removal in the Appalachian Mountains. Find out how -- and then find out what you can do about it. The Green Miles is most closely tied to Cogentrix's Birchwood Power plant in Virginia's King George County. According to the site, "This power plant purchases coal directly from Central Appalachian strip mines. Of the Appalachian communities featured on this site, the one most closely connected to this power plant is Bob White, West Virginia." The Virginia Department of Mines, Minerals and Energy has released details on how to give your feedback on Gov. Tim Kaine's Virginia Energy Plan. You can submit short comments online or submit long comments via e-mail (not sure how/why they're separating the two). For more details, you can visit energy plan website or download the complete PDF document (5.5MB). You can also read The Green Miles' review of the the Virginia Energy Plan or the Sierra Club's alternative Citizens Energy Plan (777K PDF). 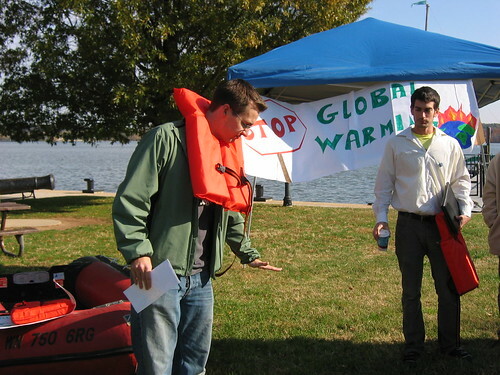 In response to the newest report by the Intergovernmental Panel on Climate Change, join area youth, and environmentalists on Alexandria's threatened coastline to voice concern that sea level rise, due to global warming, will greatly effect the Chesapeake Bay region's surrounding communities. Attendees will be addressed by community leaders including Alexandria's Vice Mayor Redella S. "Del" Pepper and Adam Ebbin, Virginia State Delegate 49th District. The Chesapeake Bay region (including the Potomac) has one of the most vulnerable coastlines to sea level rise. According to the National Wildlife Federation, due to land subsidence relative sea-level rise in the Chesapeake Bay region could reach 17 to 28 inches above 1990 levels by 2095. An increase significantly greater than the Intergovernmental Panel on Climate Change average projected sea-level rise. On Saturday we will gather at this beautiful, threatened coastal park to thank our elected officials who have taken action and to ask all our elected officials to ensure their actions are as strong as the science says is necessary to avoid the worst effects of global warming.